Escape from Bug Island is a 2006 Wiititle whose back of the box description hails it as 'the creepiest survival horror game for the Wii'. A quick glance at the box art confirms this to be a vacuous truth as it also was the only game in its genre on the console at the time of its release. Best time: 1:00:22 by 'SCXCR' on 2013-10-21, done in 20 segments. Before getting into the game, I must say I owe honorableJay and TheThrillness on the SDA forums for helping make this video watchable. Escape from Bug Island is quite literally a dark game and without their help this run would look like either an unwatchable mess or a grainy, desaturated (but visible) mess. This is why the run starts with me cranking up the brightness to 7. 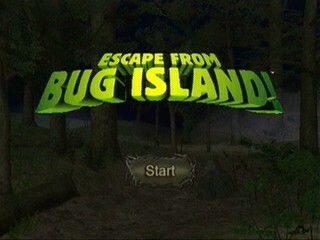 Escape from Bug Island, originally called Necro-Nesia in Japan, proclaimed itself as "the creepiest survival horror game for the Wii" on the back of its box. Technically that's true because, at the time of its release, it was the only survival horror game for the Wii. Could you imagine being in Japan and getting this game with the Wii when it launched? It's about a guy named Ray who travels to a strange island with his lady friend Michelle, who came here to study the insect life on the island, and Mike, who came to try and steal Michelle away from Ray and presumably to act as protection, judging by the shotgun he always lugs around. Michelle and Mike disappear from the camp during the night and Ray goes to find out where they went, despite his fear of bugs. Bam. Story. Anyway, the game was received poorly in Japan and Eidos decided to change a few things about it before localizing it in North America. They added bonus objectives (e.g. kill X amount of Y enemy), tweaked the controls and added end-of-the-level status screens among other things. It still got panned by critics and sold poorly. -Since this is segmented, I collect no health items and instead let Ray regenerate what health he can. In single-segments I usually grab a few, since some parts of this game can be a pretty random such as enemy placement and spawns, attack patterns, etc. -All cutscenes and dialogue sections count toward the in-game timer, so they all get skipped when possible. The one exception is the ending after the boss dies. -It may not look like it, but this game (despite Eidos' efforts) is still a bit difficult to control. Turning is very sensitive, doing one melee attack frequently registers as two and when using throwing weapons, Ray will sometimes only throw an object five feet in front of him for no apparent reason. On the plus side, it's one of the few games that caters to my left-handed play style. If the video seems to flicker sometimes, it could be because the use button and the first-person view button are the same. -Whenever I do either the side rolls or back-step, I'm vulnerable shortly before and after the dodge animation, but invincible during it. The only reason I don't do this the entire run is it's only done to the sides or backwards and is slower than running. -Keeping the flashlight off keeps some enemies away, but most enemies in the game have a set "aggro line" on the map where, if I step over it, they attack. Also, the flashlight can cause lag in some heavily-wooded areas if it's turned on. -With the exception of the ant bombs and the handgun, all of the weapons I have are either in my inventory to start the game (the tree branch and 99 rocks), given by other characters during cutscenes or dialogue exchanges (shotgun), or necessary to progress in the game (insecticide, sickle, machete, molotovs). -With one-handed weapons I almost exclusively use the low attack. It's fast and, unlike the middle attack, has less of a chance of having the second hit of the combo not register. Also, if I hit the B button prompt to finish a downed enemy as it's falling to the ground, Ray will do the finisher much faster than normal, saving a couple seconds per kill. This is just a matter of taking as straight a path as possible while not getting a flying fish to the face. Fun fact: Looking up into the trees in certain areas produces massive lag, especially with the flashlight on. It's necessary to knock down the mantis nest and use the lighter on the lamp in the cabin, otherwise Harry and Lynn won't appear in the shack to the west. Getting the insecticide is also needed to trigger the "boss" encounter with the gorilla. If the path I take through the area seems to weave around at times, it's because I'm trying to avoid pitfall traps. I don't know who put them there or why, but there are eight traps laid out around the central and eastern part of the stage. The gorilla fight functions in a somewhat strange fashion. It's not possible to kill the gorilla, but it can be driven off by surviving for three minutes. On top of that, any damage done to the gorilla can help knock off time from the three-minute ceiling. The gorilla's weak point is its face, but that's only vulnerable at certain points and for certain animations. I use the rocks because it's the one weapon I have that can reach the gorilla's face and each one does almost one-and-a-half times the damage a swing of the tree branch would. Most shots are aimed at the legs because rocks thrown at the torso tend to phase through and not register as hits. Also, the gorilla character model's bulk extends beyond its body so that Ray can't actually get close enough to hit it with short-range melee weapons unless he's aiming for the side of its leg. The damage I do to the gorilla by trapping it with the log and the tree saves nearly a minute of time. Oh, and Harry got killed by the gorilla. Yay. Moving on. The crickets are especially annoying as they tend to gather and clog up some paths. At one point I use the dodge roll's invincibility frames to get past some toxic caterpillars. Later in the stage I intentionally fall off a log crossing because at the bottom of the ravine is the sickle, a weapon that's needed to cut through the vines leading to the next section. I flick on the light because it causes items to shine, making it much easier to see. I was going to anger the crickets anyway by falling on them, so whatever. The hit detection on the vines near the end is suspect at best unless I'm doing high attacks. Fortunately I was fast enough to get out of aggro range from the cockroaches and not get caught by any of the crickets. This is one of the largest stages and also one of the most annoying as it introduces frogs, flies and log crossings with flying fish. The flies can't damage Ray, but they can get in his face and force him to stop and swat them away, which lets the frogs get a free shot at him. I try not to kill them at points and just drive the flies away with the bug spray to avoid getting the bonus objective for killing 20 of them. Early on and near the second crossing I get stopped by flies a couple times, but I would have waited anyway to get the timing of the log crossings down and not get hit by the fish. Later in the stage I take a detour to grab the safe key and the jar of honey and some of the flies get stuck in the ground because... uh... Even though it technically isn't necessary to get the honey to complete the game, it is a big help because of the next section. I save the bombs by using rocks to blow up the ant colony. I then use a couple ant bombs thin out the baby spiders enough that I can get the giant spider down without getting hit or, worst case scenario, having one of the baby spiders jump in front of me as I'm doing this, causing the bomb to explode in Ray's face, taking off more than half his health bar. Oh, and Mike fell off the bridge and died. Yay. Moving on. Picking up the journal entry in the cabin flags the cutscene where the lizard women arrive. I need them because I have to kill one to draw away the instant-death bug shroud blocking the path to the north. I should note that each narrow crossing in the game has its own set pattern for leaning from side to side, but almost all of them follow the "sway one direction, sway the other direction, go back to the center" pattern. Beyond that it is possible to fight the boss in the sandy area, but it's much faster to just run to the cave entrance and trigger the cutscene. Oh, and Robert and Lynn died. Double yay. Moving on. This is just one long sprint through a maze riddled with enemies. The canine men are the only major concern because they're just a touch faster than Ray's casual jog and can do a leaping attack if they get too close. I weave a little to the side at points instead of going straight through the tunnels to lead this attack away from Ray. Compared to stopping to hit and stun the first canine man, this method is slightly faster. Running along the right wall only attracts the attention of a few mantises, which I kill because if I don't they can easily surround me with the fourth mantis when I try to knock down the nest. I was able to get the Blue Plate out of the nest just before the fourth one arrived. Never mind that, though. It's gorilla time! Specifically, it's time to run past the gorilla and into the cave because this fight is 100% optional! The one annoying thing here is the gorilla almost always stands still or taunts twice to start the fight, blocking the path to the cave with its amazing invisible wall ability. There's a very slim chance he'll either throw a boulder or simply run over Ray when approached like this. The bridge crossing at the beginning is a potential run killer because getting hit by the rocks is a one-hit kill. Thankfully the rocks fall just slow enough and the crossing pattern is fairly simple compared to other points in the game. In the second canine man area three flies are supposed to spawn, but following a tight enough line from wall to wall while entering the area causes the flies to not spawn. The flies around Michelle for the "under 30 second" bonus objective have set starting positions, but not set flight patterns. I use the sickle, even though it misses a couple times, because the insecticide has trouble hitting any flies a certain height above Ray, even while aiming up. Guiding Michelle to the end of the level is quite annoying as she stops 1) if Ray is too far away, 2) if an enemy touches her, and 3) if her terrible AI feels like it. As such I have to spend a little time taking out spiders from afar with rocks, though just enough to sneak along the right wall. I was pretty lucky the stray spider or two didn't bump into Michelle and cause her to stop, but not lucky enough to hit all the spiders on the first throw. Also, Michelle's AI causes her to path around in a giant circle after the next cutscene and, if she's too far away, the following cutscene in front of the wall won't trigger. And now everyone's dead... or are they? This takes a little explaining. In the cutscenes I skipped Michelle gives Ray the key to her bag, dies, then Ray gets knocked off a cliff and into some kind of time vortex that sends him back to the beginning of the game, except he still has all the items he picked up from the first half of the game and several other things are either out of place or still clearly affected by the previous playthrough. Since this includes the key to Michelle's bag, I go ahead and open it to get the handgun and the pocket light. Despite these being the same areas, the enemy spawns have changed in some parts. Instead of centipedes there are baby spiders leading up to the Grove, but the same strategy as before applies. This time I have to go to Harry and Lynn in the cabin first, then destroy the mantis nest and come back. Destroying the nest first would cause it to respawn after going to the cabin. Once the gorilla fight starts I use a nearby tree as a way to block the pathing of the mantises and hit the gorilla in the face (hitting Harry works too) with a rock. Harry is saved! At one point I go into the menu and equip the machete because it helps get both mantises near the nest incapacitated faster, and because I need to equip it to finish the next stage anyway. Also, sorry for the long pause at the end of the stage. When I hit the level completion screen I thought my capture software wasn't recording and had a mild panic attack. This is quite possibly the stage I hate the most, simply because there is so much that can go horribly wrong. This time there are five or six cockroaches in the early section which force me to weave around a bit more than usual, especially since the ground charge attack can hit from about a foot and a half to either side of the widest point of the cockroach. The crickets have a tendency to create a log jam at the second cockroach and the first cockroach can/will fly over some out of bounds sections to keep attacking Ray. Later on none of the maggots in the hollow log bit me, which is pretty rare as that usually happens at least twice, costing about a second each time. The log crossing is where things get pretty bad. The flies tend to behave very randomly when getting near the log crossing. Sometimes they attack, sometimes they get stuck in the ground, sometimes they nosedive into the pit and attack while I'm crossing, and sometimes they won't aggro at all until I start crossing the log. I use the light to attract as many as possible and, admittedly, cross the first log and just pray the flies at the next section won't come over and knock me off. Using the machete to cut the thicker vines is much tougher thanks to there being a carnivorous plant and two cockroaches positioned right in front of them, on top of the other cockroaches and crickets within aggro range. This is an absolute mess until the vines come down and I can roll dodge over the caterpillar to end the stage. Frankly, I was fortunate to only get hit once, and not by an attack that forces the "you've been grabbed, shake them off "sequence. I try to spend as little time in the water as possible due to how slow Ray swims. The molotovs are necessary both to destroy the moth nest and for something in the next stage. By staying in the water and not directly approaching the nest before throwing the molotov, I avoid triggering a cutscene. The attack timing of the spiders at the beginning is random. The placement of the spiders in front of the bridge is random. The attack pattern of the boss is almost entirely random. If it weren't so short, this would be the stage I hate the most. I melee the ant colony (which is surrounded by spiders because... reasons) to save at least four bombs for the next stage. I also kill the spiders in front of and on the bridge because if I don't they'll show up during the boss fight. At that point they'd not just attack me but leave me unable to move at times. My main strategy for the boss is to take advantage of the spider's jump attack by repeatedly getting behind it and stabbing it in the back. Despite getting hit, the boss gave me a really good pattern for getting a ton of shots in on it, constantly stopping to screech and almost always doing the jump attack. The giant spider doesn't have a set pattern, just three attacks, a taunt and one rare evasive maneuver. If I'm standing still it will usually either do the poison spit attack (not seen in the video) or the jump attack. Now Mike is safe and we can get the shotgun and gas mask (needed for the Cave of Time), as well as a box of shotgun... bullets? One roll over a caterpillar later, I use a couple ant bombs to knock down the nearest lizard woman and use the quick "B" finisher to attract the swarm blocking the other half of the stage again. Beyond that I grab the shotgun shells- oh, sorry, shotgun "bullets" from the barn in some early prep for the final boss. When I get to the boss fight with the giant sand worm I run to the side of one of the ant colonies in the area. Usually the worm first appears somewhere between the two closest ant colonies, but rarely it will come directly at me, which happened here. One exploding colony later, Robert and Lynn are safe. Yippie. Moving on. All I have to do in this stage is trigger the cutscenes where Ray finds Michelle, Robert Dallas (the only character with a last name) dies and Lynn calls for a helicopter to rescue everyone, (she could do that the whole time?!) then fight the gorilla and enter the cave. It's mandatory to kill the gorilla this time, so that means I get to have a little fun with an exploit. There's a journal entry in the game that hints at how heavy and unstable one of the statues in the area is, implying I'm supposed to lure the gorilla over to the statue, then hit it in the face to stun it, causing it to knock over the statue and die from it falling on him. However, this trigger works from multiple points on the map. Most notably, I can stand under the statue (not in front, since that triggers an extra mini-cutscene) and the gorilla will walk to the middle of the map to start throwing rocks at me. Hitting it in the face with a throwing weapon as it does this triggers the one-hit kill from several dozen feet away. Before doing anything else I equip the pocket light, handgun and shotgun while getting rid of the insecticide. The pocket light needs to be equipped first, otherwise a message will pop up when trying to equip the shotgun that it will unequip the flashlight, wasting an extra few seconds. The one detour in this area is in the spider room before the boss. I kill the two canine men because otherwise they tend to corner and eventually kill me, then bust open two crates to grab a box of handgun bullets and shotgun "bullets" for the final two bosses, trying to get hit as little as possible. Beelzebub (yes, that's the creature's name) is a really simple boss fight. The flies are the one annoying thing to deal with, but after killing most of them and running to the far right side of the stage, the handgun can stun lock him/her/it by shooting its wounded eye over and over. After killing Beelzebub all the enemies in the spider room despawn, which makes walking Michelle to the exit point much easier in spite of her AI. Since I skip over everything, what happens is a helicopter arrives at the temple, but doesn't have room to take everyone. Ray agrees to run back to the beginning of the game (don't worry, the game skips over all but the last stage) and use the boat docked there to escape the volcanic eruption triggered inadvertently by killing Beelzebub. Meanwhile Robert's corpse mutates into the final boss. This barely counts as a stage since all I have to do is skip over the cutscenes and dialogue, then run to the cave. I kept the flashlight on at the end of the previous stage to immediately attract every mantis and fly within range. There are so many flies in this area that I have no choice but to kill them and, while I'm doing that, the mantises are going with them. At times I slow down to pull one or two mantises at a time so that I don't get overwhelmed and/or screwed over by either flies or hit detection. The exception to this is the last group of three mantises, since there aren't any flies around or beyond them. Mutant Robert is random in some regards and not random in others. His general attack pattern, though, is random. At the start of the fight he can either walk forward and swipe at Ray, screech to set up his one-hit kill nosedive, start flying or use the "insect rain" attack. Here he starts flying almost immediately, which means I can use the shotgun to turn the fight into a rousing game of Duck Hunt. He always paths the same way through the air so he's easy to hit, and the delay of his flying attack is so long I can easily reload the shotgun when it runs out of shells. The one problem is that more than half of this area produces lag, so aiming becomes tougher as he rotates around the stage. Also his flies can act as meat shields, though against the shotgun they aren't much of one. And so with Mutant Robert dead, Ray escapes the island and we see that the volcano never erupted. What an anti-climax.